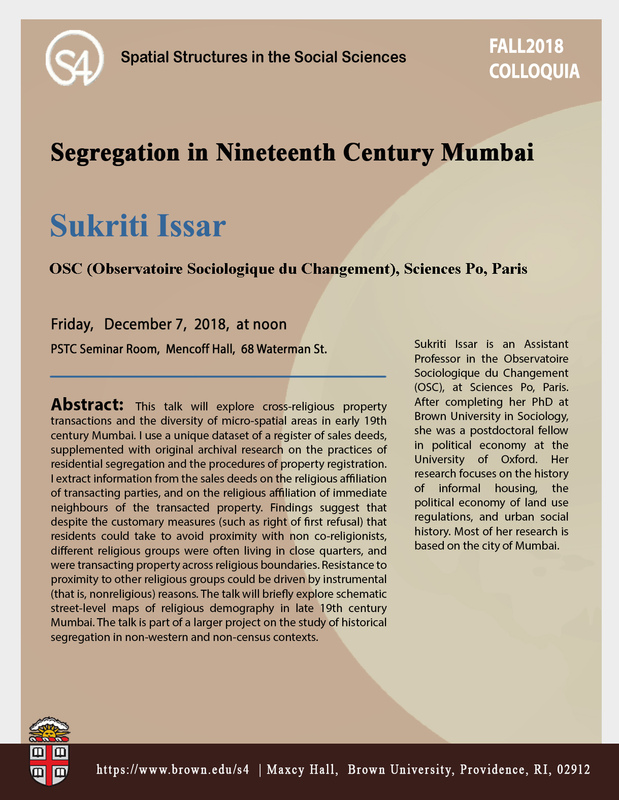 Issar will explore cross-religious property transactions and the diversity of micro-spatial areas in early nineteenth-century Mumbai. She uses a unique dataset of a register of sales deeds, supplemented with original archival research on the practices of residential segregation and the procedures of property registration. She extracts information from the sales deeds on the religious affiliation of transacting parties, and on the religious affiliation of immediate neighbors of the transacted property. Findings suggest that despite the customary measures (such as right of first refusal) that residents could take to avoid proximity with non co-religionists, different religious groups were often living in close quarters and were transacting property across religious boundaries. Resistance to proximity to other religious groups could be driven by instrumental (that is, nonreligious) reasons. Issar's talk will briefly explore schematic street-level maps of religious demography in late 19th century Mumbai. The talk is part of a larger project on the study of historical segregation in non-western and non-census contexts. Issar is an assistant professor of sociology in the Observatoire Sociologique du Changement (OSC), at Sciences Po, Paris. After completing her PhD at Brown University in sociology, she was a postdoctoral fellow in political economy at the University of Oxford. Her research focuses on the history of informal housing, the political economy of land use regulations, and urban social history. Most of her research is based on the city of Mumbai.